Here is yet another SF anthology edited by one of my favourite SF anthologists, Terry Carr. It’s a nice, beefy one this time, at 445 pages, with twelve stories, plus an introduction by Carr. I know most people usually dive on into the stories first, but take may advice, and do NOT skip the Introduction. It is a fascinating, lengthy, detailed 17-page thesis by Carr, which serves as an excellent historical background to the First Golden Age of Science Fiction. This one is an absolute must for anyone, like myself, who is as much a student of the history of science fiction as I am a fan of the literature itself. Intriguingly, and in addition to the fantastic main Introduction, each of the twelve stories has its own multi-page introduction, each of which which gives detailed background information on the author and the story itself. How I wish that every anthology would do this. And then there are the twelve stories themselves. And what stories they are. 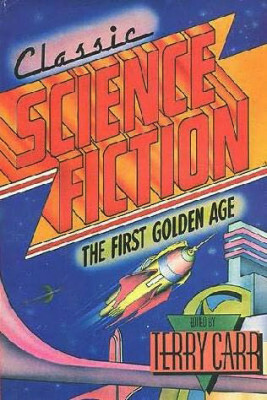 This anthology contains some of the greatest short stories from the Golden Age of Science Fiction, and I’m familiar with most, but not all, of them, as they’ve appeared in other anthologies or single-author collections. Just looking at the roll-call of authors, it’s like a who’s-who of the biggest SF names from that era. Of course, eight of the twelve stories are from Astounding Science Fiction, which is unsurprising, as it was by far the biggest SF magazine of the Golden Age. We have two of the best of the early stories written by Isaac Asimov, as well as one of the best and probably the most famous story written by Henry Kuttner, and likewise absolute gems by Eric Frank Russell, Theodore Sturgeon and Lester del Rey. I’ve always been a huge fan of Leigh Brackett, and her story “Child of the Green Light” is also a cracker. Even the two stories that I was totally unfamiliar with, “Storm Warning” by Donald A. Wollheim and “Into the Darkness” by Ross Rocklynne, are excellent stories. A. E. van Vogt’s story “Vault of the Beast” easily ranks up there alongside “Black Destroyer”, “The Monster” and “Dormant”, as one of my all-time favourite van Vogt short tales. And the two Robert A. Heinlein short stories, “By His Bootstraps” and “-And He Built a Crooked House-“, well, what superlatives can I heap upon them other than to say that they are two of the greatest SF short stories ever written? As this is an older book, and has been out of print for a number of years, I guess anyone looking for a copy will have to haunt the second-hand/used books stores. And if you spot one, snap it up right away! This is a fantastic anthology of Golden Age SF short fiction. I enjoyed every single story, which is something that I rarely say about most anthologies, as there are usually at least one or two stories which aren’t as good as the rest. Terry Carr very rarely disappointed with his anthologies, and with this one, he came up with the goods yet again. This is an absolute gem of an anthology, and I’d recommend it without any hesitation to all fans of Golden Age SF.